SAINT-AUGUSTIN-DE-DESMAURES, Quebec (26 July 2011) - Canadian hardwood flooring specialist Preverco has launched Wave, a new collection of flooring featuring what it believes is a unique texture whose origins can be found in the studied board planning and polishing techniques used by wood craftsmen in South America. "To capture the spirit of the islands and their surf, our research and development team has created a brand-new ‘hand-scraped' type of finish. Inspired by the work of these artisans, we have developed a unique manufacturing process that allows us to obtain a wavy texture offering an absolutely striking effect!" Preverco vice president of marketing Etienne Chabot said in a statement. In the company's first offering, the Wave texture is being made available in 16 different shades, all of which Chabot said "are evocative of the islands or well-known seaside resorts whose names alone are the stuff of dreams. Some of them embody authenticity within a modern, urban context while some others will fit more traditional decor." Preverco believes the variety of colours and textures offer a richness and depth that is rarely produced by North American flooring manufacturers. The 16 shades are: Laguna; Baja; Maui; Nembrala; Fujisawa; Seychelles; Maldives; Fidji; Bali; Bora; Samoa; Ibiza; Caïcos; Waikiki; Makaha; and, Navagio. The Wave texture is currently available for shipping to retailers across the country. The company's web site can be found at www.preverco.com. 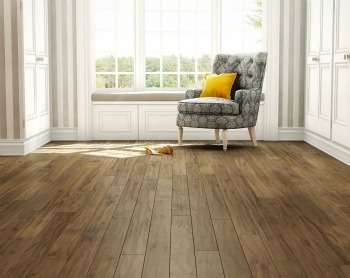 Preverco has launched a new hardwood flooring collection that features a new Wave texture in its finish. It's seen here in Bora, one of 16 different shades.